This is an adventure to test yourself on; the combination of 2 full days paddling, sandwich an overnight camp in the beautiful Matchstick Wood. This trip is specifically designed for those who want a little more of a challenge compared to our more relaxed itineraries. You will get the massive sense of achievement by completing an 8.5 mile paddle on day one, followed by another 10 miler on the following day. You will get the very best of our most popular trips by covering the extra distance and by doing so, you will have many more stopping points for the odd drink or well-earned lunch. You will begin the in historic village of Bromham, shortly after reaching the beautiful architecture of Bedford, before re-joining the countryside to arrive at Matchstick Wood. You will get your own private clearing in the woodland, complete with long drop loo, log store and most importantly, a campfire, to sit round under the starry night sky. Once you’ve pitched your tent, have the campfire roaring with the wine/ beer cooling in the brook this trip will seem like the ideal tonic to a busy life, allowing you to time to relax after a good days paddle. The following day, you will have a stunning paddle through some of the best voted wild swimming sites in the UK, winding your way through the leafy countryside before arriving in St Neots. 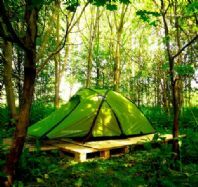 You can always book our luggage service to lighten the load, and your camping kit will be in the woodland waiting for you when you arrive.